Entering the final stretch of conference play, Ole Miss hit the road to face a hot South Carolina team that was coming off series wins against both LSU and Vanderbilt. The Rebels and Gamecocks began the series positioned to compete for the coveted bye in the SEC Tournament, awarded to the top 4 teams in conference play. Here’s your recap of all the action from the series. Ole Miss scored in their half of the first inning as Ryan Olenek extended his hitting streak to 21 games when he took a 2-1 pitch over the left field wall. The Rebel lead would be short lived, however, as South Carolina scored early and often, plating three runs in the home half of the first, four runs in the third, and five runs in the fourth. Rebel ace Ryan Rolison was chased by the Gamecocks in the fourth inning after giving up eight earned runs and a total of 11 runs on 10 hits in what was his shortest outing of the year. Offensively, Olenek was the star of the game with a 4 for 5 day at the plate. He had two singles, a double, the first inning home run and recorded three RBIs. Attn: @ROlenek is 4-for-4 and is now hitting .412 on the season. Shortstop Grae Kessinger added a solo home run of his own to lead of the fifth inning. Cole Zabowski went 2 for 3, notching two singles. Ole Miss pitcher Austin Miller had a quality performance out of the bullpen, throwing 2 ⅓ innings, giving up only one hit, no runs, no walks, and recording two strike outs. Head Coach Mike Bianco praised Miller’s performance after the game. After allowing double digits runs Friday night, Ole Miss looked to bounce back from the Friday night loss. Unfortunately, the Gamecocks were hot as South Carolina scored early and often. They tallied 10 runs across three innings–the third, fourth, and fifth. The Gamecocks would get into the Rebel bullpen in the fourth inning after co-captain Brady Feigl allowed eight earned runs in 3 ⅓ innings. The Rebels launched an eighth-inning rally to cut the South Carolina lead and make things interesting. Cole Zabowski, Will Golsan, and Tyler Keenan would each lead off the inning with singles. Pinch hitter Tim Rowe then doubled and Kessinger followed with his second home run of the weekend, bouncing off the top of the left field wall. There's no quit in these Rebs. @Swagulater15 goes deep for the second straight game to cut the deficit to four. Kessinger, Zabowski, and Golsan each turned in 2 for 4 days in the plate. Rebels pitcher Houston Roth saw his first action on the mound since April 10th. The sophomore, who earlier this season was reported to have sustained a hamstring injury, threw two innings of scoreless, one-hit baseball. With his double in the fifth inning, Ryan Olenek extended his league-high active hitting streak to 22 games. That’s just what his Rebels did. With the wind blowing out at Founder’s Park in Columbia, the ballpark was ripe for the picking by the power hitters. BREAKING NEWS: @thomas_dillard7 can hit a baseball very, very far. Ole Miss scored first with two solo home runs in the second inning off the bats of fight fielder Thomas Dillard and designated hitter Chase Cockrell. Nick Fortes added a solo home run in the fifth. The seventh inning saw the Rebels get going on one-out single by Nick Fortes, followed by a double from Ryan Olenek. Olenek previously singled in the third inning to improve his hitting streak to 23 consecutive games. Fortes scored on a deep fly to right field by Cole Zabowski. After seven complete, South Carolina held a 5-4 lead over the Rebels. In the eighth inning, Chase Cockrell knotted the game up at 5-5 with his second home run of the game. 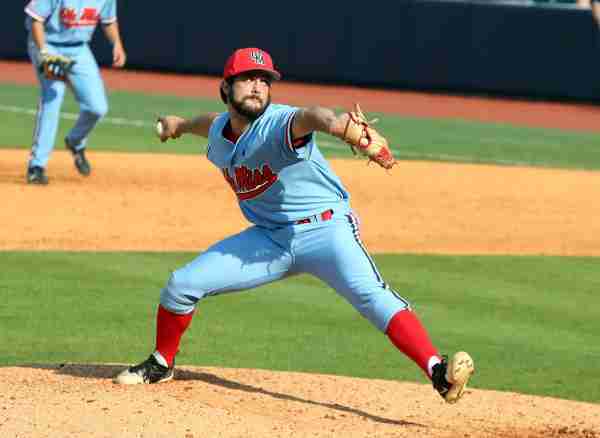 Reliever Parker Caracci pitched an outstanding game for Ole Miss, going 4.0 scoreless innings with four hits and no walks allowed to go along with four strikeouts. In the bottom of the eighth, the redshirt sophomore pitched out of a huge jam. With Gamecock runners on first and third with no outs, Caracci induced a line out to second baseman Anthony Servideo, a pop out to shortstop Grae Kesssinger, and then struck out the last South Carolina batter to keep the Gamecocks off the board. In the tenth inning, co-captain Will Golsan led off with a single. Tyler Keenan barely missed a home run, belting a double high off the right center field wall off an 0-2 pitch. Cockrell’s sacrifice fly scored Golsan and gave the Rebels a 6-5 lead that would ultimately be the game-winning run. South Carolina managed to load the bases in the bottom half of the tenth, but Caracci was the picture of composure, striking out the last South Carolina batter swinging. It was Caracci’s longest appearance of the year, comprising 74 pitches and earning him his third win of the season. The Rebels improved 36-11 overall and 13-11 in the SEC. With final exams for Ole Miss students this week, the Rebels do not have a mid-week game. Bianco’s squad returns to action for the last regular season series of the year at Swayze in a Thursday-Friday-Saturday contest against Auburn. Game times are 6:00 p.m., 6:30 p.m., 4:00 p.m., respectively.